Single point "bruted diamond" dressers are made with selected "Congo Rounds" mounted in a matrix. A Single cutting edge is presented to the grinding wheel. Diamonds for single point dressers are selected in accordance with quality and size. The question of using a superior, average or commercial quality, depends on the grinding finish required and the machines and working parameters. Natural Point Diamonds : The Diamond points are naturally formed. (Not made like grades A, B & C) This is a gift of nature. Natural Point Diamond Dressers have high from retention properties. Availability: 0.10 Ct to 2.50 Ct. Considerable care should be taken in mounting the diamond dresser in position. Diamonds are sensitive to shock and impact. The dresser must be clamped rigidly in place to avoid vibration once dressing begins. An ample supply of coolant should be directed at the diamond point before dressing begins, as the sudden application of coolant to the diamond once it has heated up can cause it to shatter. The diamond holder should not be set directly on the center of the grinding wheel, but at an angle of 5-15 to the direction of rotation of the wheel so that it appears to be "trailing"
At normal wheel peripheral speeds, dressing rates of approximately 20-25 m/sec can be achieved. The cross feed rate is dependent upon grit size and can have a market influence on the quality of the finish imparted to the grinding wheel surface. The lower the feed rate, the finer the surface finish. We would recommend the following feed rates per revolution of the grinding wheel. Standards shanks 1/2" x 6" upto 2.50 cts. Standards shanks 5/8" x 6" over 2.50 cts. Shanks are also fabricated according to your blue prints. 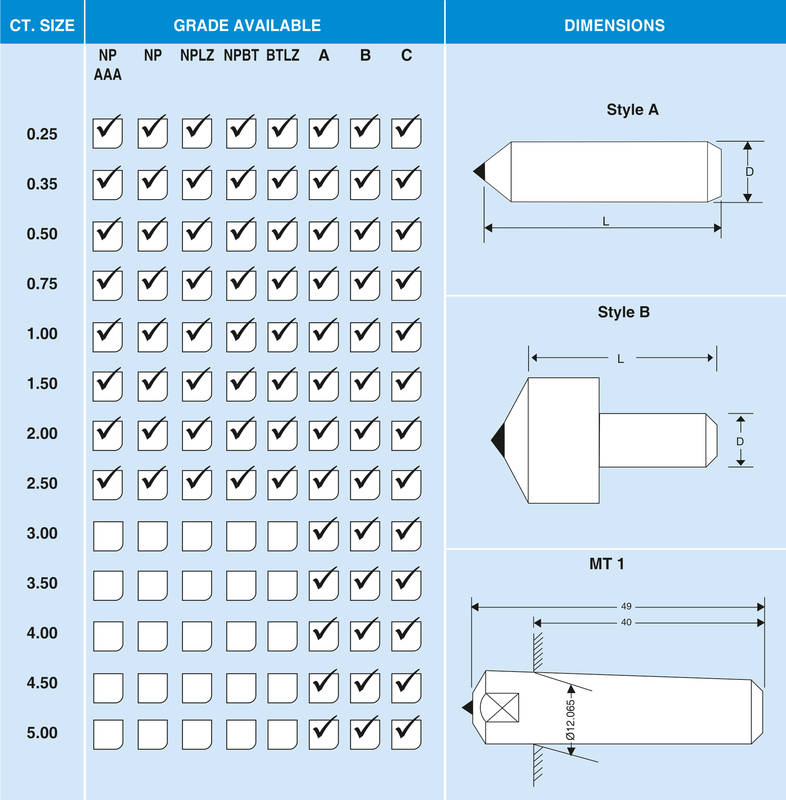 While ordering specify grade & ct. wt.